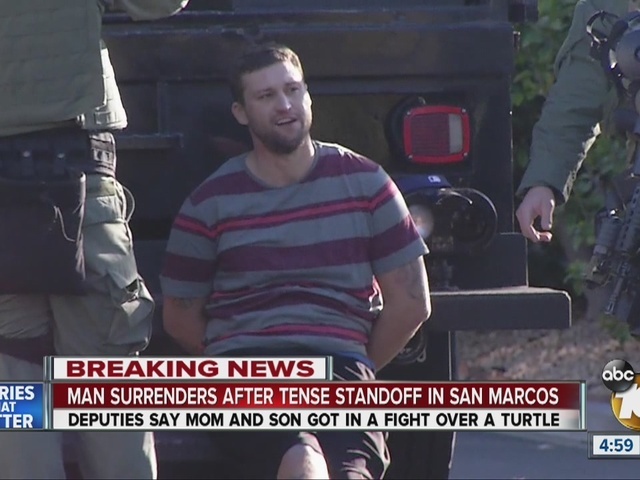 SAN MARCOS -- A SWAT standoff that erupted at a San Marcos mobile home park on Saturday was over a turtle, a sheriff's deputy told 10News. The standoff began around 10:30 a.m. when police got a call about a man making criminal threats at home in the 3500 block of Linda Vista Drive. His mother had called 911 fearing for her safety, saying her son was threatening to kill her and any police officers that showed up. The suspect, later identified as 27-year-old David Nelson, holed himself up for several hours and was taken into custody after authorities threw tear gas into the home. His mother was unhurt. It was then the story behind it all was revealed -- that an argument over a turtle had escalated quickly. Sheriff's deputy says the standoff started after David Nelson killed his mom's turtle, they argued, and he threatened to kill her. Law enforcement at the scene said Nelson is intellectually disabled.